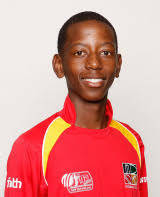 HATHERLEIGH’S overseas player for 2019 will be former Zimbabwean batsman Confidence Tinotenda Mutombodzi. Mutombodzi, know to team-mates as Tino, played 50-over and 20-over white-ball cricket for Zimbabwe between 2011-2015. His last appearances for Zimbabwe A were against Kenya in early 2018. He appeared in two ICC Under-19 World Cups – Malaysia (2008) and New Zealand (2010) – and has toured India and the West Indies with national sides. Mutombodzi is still going strong in First Class and List A cricket for Mashonaland Eagles. He averages 27.83 with the bat in First Class cricket and 22.39 in 50-over games. Mutombodzi began his career as a leg-break and googly bowler before being converted into a batsman. He still bowls regularly and has 139 First Class scalps and 58 more in List A Cricket. English cricket is something Mutombodzi is familiar with from two previous stints in Premier Leagues. He scored 523 runs for Brooke in the Norfolk competition last season. Back in 2015 he made 471 runs and claimed 21 wickets for Eversley in the Thames Valley League.